Elite Ammunition disassembles your FsN. We send it to ROBAR. 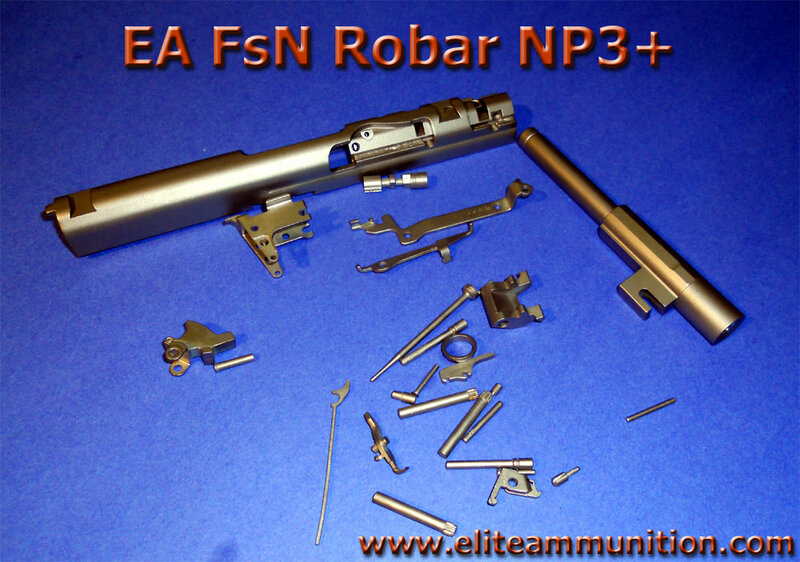 Once returned from ROBAR we reassemble your FsN including all fitting, test fire and return to you. Slide, Barrel, and all internal components of slide and frame will receive the NP3 Plus finish. This can be combined with accurizing or Hydro Dipping for a small savings since your FsN will have to be disassembled for that service. Attention: Due to the reduced friction the NP3+ coating has on the internals you will have to replace your stock magazine springs with EA’s HD magazine springs to compensate for the increased speed of the slide cycling due to reduction of friction. 3 EA HD springs will be included with returned pistol. If FsN is MKII new style springs will be shipped. If older USG old style HD springs will be shipped. NP3® PLUS HAS ALL THE SELF LUBRICATING ATTRIBUTES OF OUR ORIGINAL NP3® FIREARM FINISH. However, NP3® PLUS offers far more corrosion resistance for marine and other hostile environments. Firearms and other equipment gain up to five times as much corrosion resistance over standard NP3® and up to ten times more than regular electroless nickel! NP3® PLUS is an excellent choice for protecting all firearms deployed in wet environments. This includes shipboard operations and environments where there is frequent exposure to rain, salt spray and high humidity. NP3® PLUS works great with our Roguard and Poly-T2 finishes for a two-tone look, and carries a lifetime warranty. SELF-LUBRICATING: PTFE is deposited throughout the coating so for most firearms no additional lubrication is needed after initial break-in. ACCURATE PLATING THICKNESS: Coating thickness can be predetermined for nominal tolerance to suit your weapon system. EASY TO CLEAN: NP3® Plus is easy to clean; in most cases wiping with a rag will suffice (We do NOT plate the inside of barrels; these need to be cleaned conventionally). PLATES TO MOST GUN ALLOYS: NP3® Plus can be plated to almost all alloys used in the firearms industry. This includes steel, aluminum and stainless steel. SERVICE LIFE IS EXTENDED: NP3® Plus has a high lubricity and low coefficient of friction; therefore, the life expectancy of a firearm will be greatly increased due to less frictional wear. NO COROSSION MIGRATION: In cases where the coating is damaged and perforated, the corrosion shows no tendency to spread or migrate under the coating. EASY TO REPLATE: NP3® Plus is chemically strippable and can be re-plated without any damage to the substrate. Weapons subject to heavy use can be refurbished to as-new condition. SAVES MONEY: Taking all the attributes of into account, it is easy to see that service life, hours in service, low maintenance and ease of cleaning combine to make this a money saving addition to any firearm. The application of NP3® PLUS is auto catalytic, which means that the plating process does not require electricity. The auto catalytic process is preferable to standard electrolytic plating as all active surfaces are evenly plated, which is not the case with electrolytically deposited coatings. NP3® PLUS is a true composite coating. Sub micron particles of PTFE are co-deposited in the nickel matrix. As wear occurs, fresh particles of PTFE are exposed, maintaining the lubricating qualities of the coating. NP3® Plus gains its superior corrosion resistance by a process of Duplex Coating – the inclusion of a very corrosion resistant undercoating working in harmony with the nickel / PTFE plating process giving a coating of outstanding corrosion resistance.